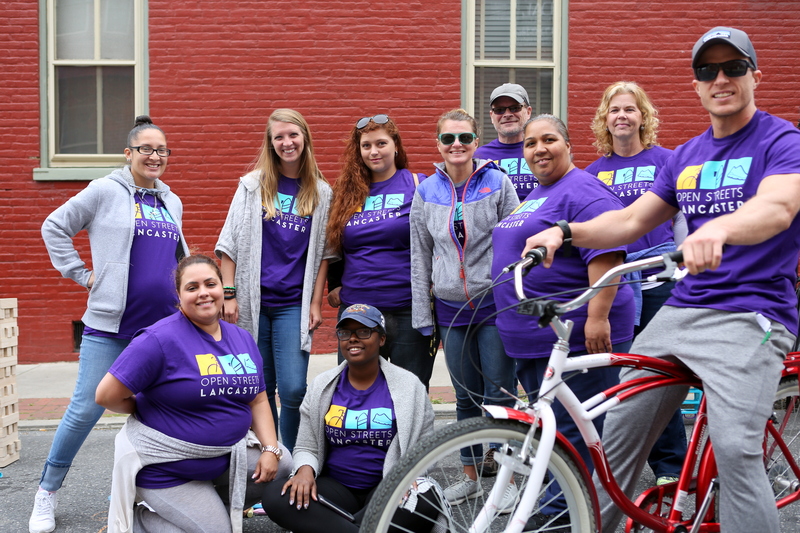 Thank you for your interest in volunteering at Open Streets Lancaster! Open Streets Lancaster is planned by the Lancaster Recreation Commission but is powered by nearly 100 volunteers on event day. An all volunteer meeting will be held the week prior to the event in the evening at the Lancaster Recreation Center on Fairview Avenue. Review the volunteer descriptions below for more information. We’ll see you on May 19th! If you have any questions about Open Streets volunteering, please email Audra Landers: alanders@lancasterrec.org. This is the most important position and the one where we need the most help! This position requires a person at each intersection to help facilitate ‘vendor’ set-up. At least 14 volunteers are needed! You will be in direct contact with the event organizer during the morning set-up process. You will be responsible for making sure the proper ‘vendors’ are entering on their assigned street and are setting up appropriately on the block itself. You will receive a clipboard with all the necessary information. There is one shift available: 9 am – 11 am. You can enjoy the entire event after you have given back to your community! You must check into the volunteer tent 15 minutes before your shift. Volunteer while having fun! The Fun Police will receive sidewalk chalk, hula hoops, bubbles, jump ropes and/or another fun activity for their station. Your main task is to help engage participants by adding creative drawings or facilitating a game at your intersection while asking event-goers to help out! This is a fun way to volunteer with a friend or family member! There are two shifts to choose from: 11 am – 1 pm and 1 pm – 3 pm. You must check into the volunteer tent 15 minutes before your shift. You are so flexible! You are up for any position we give you! Mystery Mob volunteers are the heroes of the day who fill in major gaps and make sure everything runs smoothly. We ALWAYS need extra volunteers. Even if all positions are filled for the day, you can still sign up for a Mystery Mob and we’ll put you to work! Shift times determined at a later date. Are you a professional or aspiring photographer with your own camera? We are looking for volunteers with photography skills to capture the spirit of the event! Your photos have the opportunity to be featured on our website, social media outlets and printed materials with credit given. The Shutter Squad also helps promote Open Streets Lancaster by posting directly to social media during and after the event. Flexible volunteer time during the event. We want to leave a good impression on the neighborhood and erase all traces of fun left behind (minus the awesome chalk art on the streets)! Volunteers are needed to help pick-up trash and recycling along the route after the event. Our ‘vendors’ have also requested help with tearing down their stations. Walk the entire route and help those in need along the way! There is one shift to choose from: 2:45 – 3:45 pm. You must check into the volunteer tent 15 minutes before your shift.